This article describes the components and services related to multi-tenancy in SharePoint Server 2013 and also provides architectural, security, operational, and management guidance to help service providers in gaining an understanding of multi-tenancy in SharePoint Server 2013 for planning, designing, building, and managing a multi-tenant SharePoint Server 2013 hosting platform. OneDrive for Business with Yammer integration doesn't work for multi-tenancy or partitioned service applications for on-premises deployments. Before we introduce the multi-tenancy functionality in SharePoint Server 2013, you should understand the general concept of multi-tenancy and its related characteristics; doing this will help you make the appropriate decisions for planning, designing, operating, and managing your multi-tenant SharePoint Server 2013 hosting platform. Multi-tenancy refers to the ability to manage and partition data of sites and otherwise shared services or software in order to accommodate multiple tenants. This is in contrast to running multiple instances of a service, or setting up separate hardware. In Microsoft products and technologies, multi-tenancy of services creates a hosting environment wherein server farm resources are maximized. Before learning about hosting environments, it is important to understand the services architecture. This section describes key components and services for enabling multi-tenancy in SharePoint Server 2013. A SharePoint 2013 web application is composed of an Internet Information Services (IIS) web site that acts as a logical unit of management and security for the site collections that you create. Each web application is represented by a different IIS website that uses a unique or shared application pool. When you create a web application, you also create a content database and define the authentication method that is used to connect to the database(s). Host-named site collections enable you to assign a unique DNS name to site collections. For example, you can address them as http://TeamA.contoso.com and http://TeamB.fabrikam.com. This lets you deploy many sites that use unique DNS names in the same web application. It also enables service providers to scale an environment to many customers. If you do not use host-named site collections, the SharePoint web application will contain many path-based site collections that share the same host name (DNS name). For example, Team A would have a site collection at http://contoso.com/sites/teamA and Team B would have a site collection at http://fabrikam.com/sites/teamB. Host Named Site Collections are fundamentally the only way to scale for multi-tenancy environments, and provide ultimate flexibility with respect to the URL namespace used. If using path-based sites with multi-tenancy the software boundary for managed paths will be reached extremely quickly. For additional information about how to plan for host-named site collections for SharePoint Server 2013, see Host-named site collection architecture and deployment (SharePoint 2013). A service group , also known as proxy group , is a group of service applications that are selected for use by a web application. By default, all service applications are included in the default group unless another group is specified at the time that the service application is created. You can add and remove service applications from the default group at any time. When you create a web application, you can select the default group, or you can create a custom group of services. You create a custom group of services by selecting only the service applications that you want the web application to use. Custom groups are not reusable across multiple web applications. Each time that you select "custom" when you create a web application, you are selecting services only for the web application that you are creating. When you create a service application, a proxy for the service application is created at the same time. A proxy is a virtual entity that connects web applications to service applications. 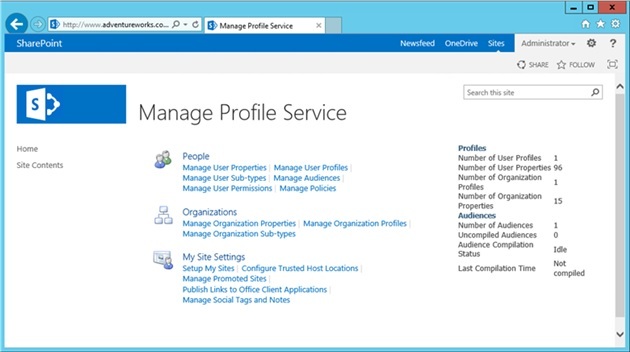 Proxies are listed on the Manage Service Applications page in the SharePoint Central Administration website. Proxies are automatically created if you use Central Administration or the SharePoint 2016 Products Configuration Wizard to create service applications. If you use Microsoft PowerShell to create service applications, proxies are not always automatically created and must be created by using Microsoft PowerShell. Some proxies might include settings that can be changed. For example, if a web application is connected to multiple instances of the managed metadata service, you must indicate the proxies that are connected to the primary service application that hosts the corporate taxonomy. Generally speaking these settings move to tenant level configuration when using multi-tenancy. A service application is a logical representation of a given service, and its security and management configuration which defines its operational behavior. Examples include Managed Metadata and User Profiles. Different service applications are implemented in different ways and this will influence the design of multi-tenant solutions. A feature pack in SharePoint is a way to group a set of site-scoped or web-scoped features together. Once the SharePoint features are grouped, they can be associated with a site subscription (i.e., tenant). All site collections in that site subscription (tenant) can use only the site-scoped or web-scoped features that are part of the feature pack. This capability enables service providers to provide tiered service offerings based on different sets of features. In SharePoint Server 2013, a new feature has been added for assigning different SharePoint licenses on a per-user basis. It also turns on SharePoint license checks at run time. This feature provides additional flexibility for a service provider to build different service offerings throughout a simplified deployment model. In previous SharePoint versions, service providers had to build different SharePoint deployment models for each SharePoint version. For additional information about SharePoint features, see the SharePoint feature availability across on-premises solutions section of the following article: SharePoint Online Service Description. Information Rights Management integration in SharePoint Server 2013 adds support for multi-tenancy, which enables the ability to manage tenant-level Information Rights Management settings. This section describes various considerations for architecting a multi-tenancy SharePoint Server 2013 environment. As described earlier in the document, multi-tenancy brings some unique characteristics to consider when architecting and designing your SharePoint Server 2013 environment. You have to weigh those factors based on your requirements to make the appropriate decisions. Understanding the software boundaries and limits of SharePoint Server 2013 will help you make the right decisions for selecting the appropriate architecture for a multi-tenancy SharePoint environment. 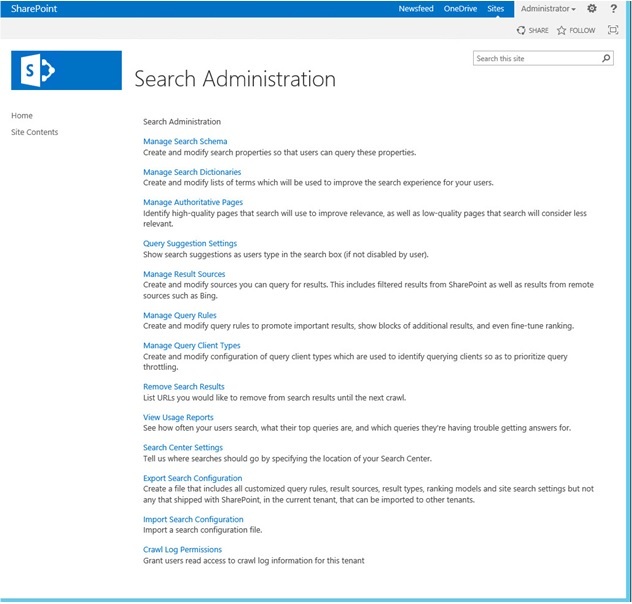 For additional information about key boundaries and limits for a content database and site collection as they apply to a multi-tenancy environment of SharePoint Server 2013, see Software boundaries and limits for SharePoint Server 2016 and Software boundaries and limits for SharePoint Server 2016. Using a shared farm to host multi-tenant site collections on a single web application provides better scalability compared to using a dedicated web application per tenant. Use a dedicated web application and application pool per customer only if you need to satisfy requirements for isolation. Do not allow full-trust code to be deployed to sites. Do not allow customizations that affect shared resources, such as the web.config file. Use host-named site collections to create multiple, root-level site collections (domain-named sites) throughout a web application. Use dedicated web applications for tenants that require customizations affecting resources that are shared across a web application, such as the web.config file. When combining multiple tenants in a single farm, use a dedicated SharePoint web application for all authenticated content and a separate dedicated web application for all anonymous content. This will require two separate subscriptions IDs for tenants with both types of content. This will also simplify licensing. Some SharePoint features are bound to web application level, such as the Self-Service Site Collection Creation setting. After it's turned on, all tenants under the same web application will be able to create site collections. In a multi-organization hosting environment in which tenant data and administration are isolated, the configuration of partitioned and shared services is very important. This example provides a practical implementation of partitioned services and also provides recommendations about how to deploy customer sites. Use a dedicated application pool per customer only if you need to satisfy requirements for isolation. Use dedicated web applications for tenants that require customizations affecting resources that are shared across a web application, such as the web.config file. When combining multiple tenants in a single web application, use a dedicated web application for all authenticated content and a separate dedicated web application for all anonymous content. This will require two separate subscriptions IDs for tenants with both types of content. This will also simplify licensing. In the following example (authenticated sites), a different host-named site collection is used for each company. Company C includes two different host-named site collections. Beneath each top-level host-named site collection, a managed path is used to create a second tier of top-level site collections for sites such as team sites, My Sites, published intranet content, or separate divisional sites. As described earlier, there are many things to consider when you plan your multi-tenant SharePoint Server 2013 hosting platform, among these factors are cost, simplified management, resource isolation, performance, and scalability. As your customer base grows, you may find it difficult to meet all of the requirements of all of your customers in a single environment. At that point, certain tradeoffs would have to occur when you seek to balance those factors. In a case such as this, an alternative that you might want to consider is a tiered-environment design in which multiple SharePoint environments meet the various needs of your customers. Each environment would focus on different aspects of your service offerings, such as low cost, high density, higher resource isolation, and better quality of services (QoS) with higher costs, and so on. This tiered-environment design approach could provide different service level agreements to your customers. As a result, you could serve a broader range of customers, simplify your management and operations, lower your management costs, and increase your profit margins. This section discusses various security considerations for planning and designing a multi-tenant SharePoint Server 2013 hosting platform. From this point forward, any section, such as the Organization Unit (OU) section, that talks about people picker configuration only works without additional customization with Windows authentication. Forms-based authentication validates users based on credentials that users enter into a logon form (typically a webpage). Unauthenticated requests are redirected to a logon page, where a user must provide valid credentials and submit the form. The system issues a cookie for authenticated requests that contains a key for reestablishing the identity for later requests. To use forms-based authentication to authenticate users against an identity management system that is not based on Windows or one that is external, you must register the membership provider and role manager in several web.config files. SharePoint Server 2013 uses the standard ASP.NET role manager interface to collect group information about the current user. Each ASP.NET role is treated as a domain group by the authorization process in SharePoint Server 2013. You register a role manager in a web.config file exactly as you register a membership provider for authentication. If you want to manage membership users or roles from the Central Administration website, you must register the membership provider and the role manager in the web.config file of the Central Administration website. You must also register the membership provider and the role manager in the web.config file of the web application that hosts the content and in the web.config file of the Security Token Service. SAML token-based authentication in SharePoint Server 2013 uses the SAML 1.1 protocol and the WS-Federation Passive Requestor Profile (WS-F PRP). It requires coordination with administrators of a claims-based environment, whether it is your own internal environment or a partner environment. If you use Active Directory Federation Services (AD FS) 2.0, you have a SAML token-based authentication environment. For web applications that use claims-based authentication, People Picker is a control that is available within SharePoint Server 2013. The People Picker control uses claims providers to list, resolve, search, and determine the "friendly" display of users, groups, and claims. For additional information about people picker configuration, see People Picker and claims providers overview. Zones represent different logical paths to gain access to the same sites in a web application. Each web application can include as many as five zones. When you create a web application, Central Administration creates the zone named Default. To create additional zones, extend the web application and select one of the remaining zone names: Intranet, Extranet, Internet, or Custom. 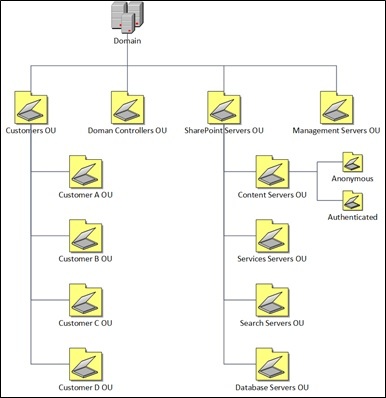 Organizational Units (OUs) organize users and computers objects in the Active Directory environment. For purposes of hosting, the Organizational Unit structure could be organized as shown in the following diagram. At a minimum you'll want to link a Group Policy to the Domain root, Domain Controllers OU, SharePoint Servers OU, and Customers OU. Security that will apply to the whole domain is applied in the Domain Policy. These settings are contained in Group Policy Objects (GPOs) that apply to the whole domain. Domain controllers hold the most sensitive data in your organization, data that controls the security configuration itself. GPOs applied at this level are used to configure and protect the domain controllers in the domain. The SharePoint servers have a unique role not included in other servers in the directory. Putting these servers in their own OU allow unique policies to be applied to these servers. They can also be segregated from other servers in the directory. Sub OUs can be created when different GPOs have to be created (such as anonymous access content servers versus authenticated content servers). This top-level OU lets all user accounts to be segregated from the rest of the directory. The next level of OUs contains the customer OUs. There is one OU for each customer. This lets all user accounts and computer accounts of a customer to be segregated from those of other customers. Furthermore this is the required OU structure to support User Profile Synchronization in multi-tenant deployments. 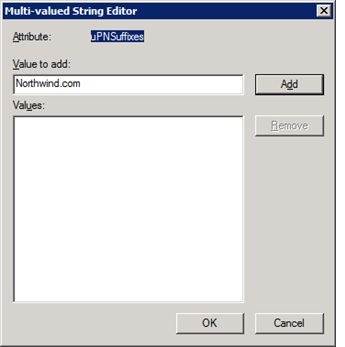 To give the users the impression they are logging into their own custom domain, use the Active Directory Service Interfaces Editor (ADSI Edit) or another AD tool to edit the uPNSuffixes attribute of each Customer OU as shown in the following diagram. Once the uPNSuffixes attribute of a Customer OU is configured, its value will be available to associate with a user account within that Customer OU, as shown in the following diagram. User authentication is the validation of a user's identity against an authentication provider, which is a directory or database that contains the user's credentials and can confirm the user submitted them correctly. An example of an authentication provider is Active Directory Domain Services (AD DS). Other common names for an authentication provider are user directory and attribute store . An authentication method is a specific exchange of account credentials and other information that assert a user's identity. The result of the authentication method is proof, typically in the form of a token that contains claims, that an authentication provider has authenticated a user. An authentication type is a specific way of validating credentials against one or more authentication providers, sometimes using an industry standard protocol. An authentication type can use multiple authentication methods. After a user's identity is validated, the authorization process determines the sites, content, and other features the user can access. The user authentication types and methods for each web application and zone. The authentication infrastructure needed to support the determined authentication types and methods. How to migrate your current web applications and zones that use classic mode authentication to use claims-based authentication. SharePoint Server 2013 supports claims-based authentication. Active Directory Federation Services (AD FS) can be configured to act as an Identity Provider Security Token Service (IP-STS) for a SharePoint Server 2013 web application. In this configuration, AD FS issues SAML-based security tokens consisting of claims so that client computers can access web applications that use claims-based authentication. You can use an alternative identity provider than AD FS. But it must support the WS-Federation standard. Also using AD FS configuration, custom code is required. For additional information about how to configure SAML-based claims authentication with AD FS for SharePoint Server 2013, see Configure SAML-based claims authentication with AD FS in SharePoint Server. This section discusses various management and operational considerations for a multi-tenant SharePoint Server 2013 environment. Capacity management is an ongoing process because no implementation remains static about content and usage. You have to plan for growth and change so that the SharePoint Server 2013 environment can continue to deliver an effective business solution. For additional information about capacity management in SharePoint Server 2013, see Capacity management and sizing overview for SharePoint Server 2013. The apps for SharePoint provide a new method to deliver specific information or functionality to a SharePoint site. An app for SharePoint is a small, easy-to-use, stand-alone app that solves a specific end-user or business need. Site owners can discover and download apps for SharePoint from a public SharePoint Store or from their organization's internal App Catalog and install them on their SharePoint sites. These apps for SharePoint integrate the best of the web with SharePoint Server 2013. They do not replace SharePoint features and solution packages, which customize or increase SharePoint sites. Unlike features and solutions, which farm or site collection administrators have to install, apps for SharePoint are stand-alone applications that owners of sites can add to their SharePoint sites. The apps for SharePoint have a simple life-cycle: they can be installed, upgraded, and uninstalled by site owners. 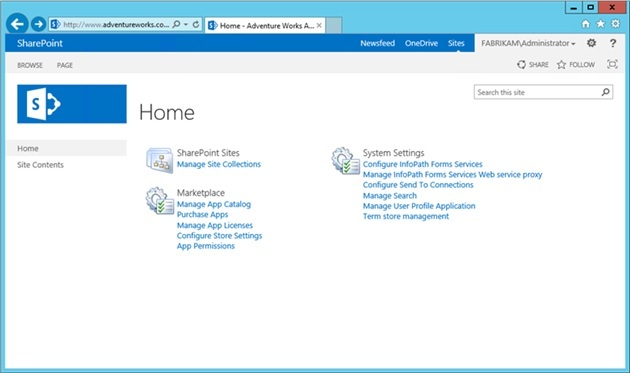 The App Management Service in SharePoint Server 2013 is multi-tenancy aware. Most of app configuration and management functionality is exposed through the Tenant Administration site and allows each tenant administrator to configure their individual settings. When performing tenant-agnostic backup and restore operations on a multi-tenant SharePoint Server 2013 hosting platform, you can follow the general guidance for performing backup and restore operations on SharePoint Server 2013 environments, see Backup and restore in SharePoint Server. When you perform tenant-specific backup and restore operations on a multi-tenant SharePoint Server 2013 hosting platform, you might have to keep the following tenant-aware components in sync with one another: service applications, workflow, content databases, and site collections. Service applications that are configured in Partition Mode have one or more associated databases that contain tenant-specific data. While you can perform general backup and restore operations on these service applications at both the application and database levels, limited commands exist to perform tenant-specific detailed backup and restore operations on these service applications or their databases. The App Management service is the service application used for managing the app for SharePoint feature that is introduced in SharePoint Server 2013. The apps for SharePoint provide a new method to deliver specific information or functionality to a SharePoint site. An app for SharePoint is a small, easy-to-use, stand-alone app that solves a specific end-user or business need. The App Management Service does not support Partition Mode, however it is natively Site Subscription aware. In the multi-tenant SharePoint environment, most of App Management functionality (that is, Manage App Catalog, Manage App Licenses, App Permissions, and so on.) is obtained by using the Tenant Administration Site. The following diagram shows App Management on the Tenant Administration Site. Once configured in partition mode, all configuration moves to tenant administration, and Content Type publishing is enabled by default. Many tenant-specific search configuration related functions are exposed in the Tenant Administration site as shown by the following diagram. Many of the *.EnterpriseSearch* Microsoft PowerShell cmdlets are now partition-aware and can be used to automate some configuration and management functions exposed in the Tenant Administration site. A large number of configuration elements move to tenant administration, however much of the configuration for Profile Synchronization remains at a farm level and is applicable to all tenants as illustrated in the following figure. 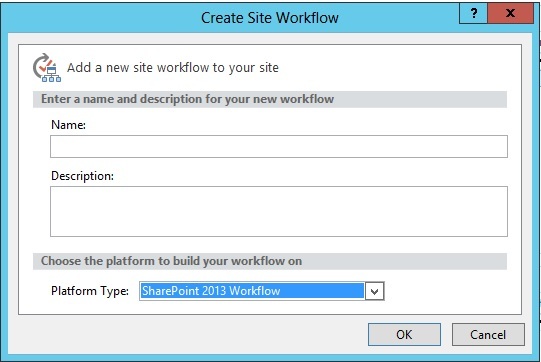 As noted previously, in SharePoint Server 2013 the Workflow platform is separate from the SharePoint platform. The Workflow platform itself uses one or more databases. While you can perform general database-level backup and restore operations on these databases, there exist no commands or utilities to perform tenant-specific backup and restore operations on these Workflow databases. If a tenant has exclusive use of one or more dedicated content databases, you can perform general database-level backup and restore operations on these databases. Having an exclusive use of one or more dedicated content databases can't be achieved by using standard product features, for example, self-service site creation. This is an example of where customization is required in order to meet a particular service level offering. The following Microsoft PowerShell script shows how to perform an initial backup action on a tenant content database. Write-Host "Tenant Content Database Backup Script Completed!" Write-Host "Tenant Content Database Restore Script Completed!" You can perform specific backup and restore operations on a tenant site collection. The tool that you choose to use depends on the size of the site collection itself. Microsoft PowerShell cmdlets are an appropriate choice for small- to medium-sized site collections. The following Microsoft PowerShell script shows how to perform a backup action on a tenant site collection. Write-Host "Tenant Site Collection Backup Script Completed!" Write-Host "Tenant Site Collection Restore Script Completed!" There are many tools that allow you to monitor SharePoint Server 2013 and troubleshoot problems. Different tools cover different aspects of the environment, although there may be overlapping areas. Consider which tools can maximize your monitoring benefits. For additional guidance about how to plan monitoring for SharePoint Server 2013, see Plan for monitoring in SharePoint Server. As described earlier, a feature pack can be used for grouping different features together and associating them with a site subscription (that is, tenant). All site collections in the site subscription (tenant) can use only the site-scoped or web-scoped features that are part of the feature pack. This capability enables service providers to provide tiered service offerings based on different sets of features. Feature packs are created that use the New-SPSiteSubscriptionFeaturePack cmdlet to create the feature pack container and the Add-SPSiteSubscriptionFeaturePackMember cmdlet to add the individual features to the container. The following Microsoft PowerShell script shows how to create a tenant-level feature pack representing SharePoint Foundation 2013 features, and stores the Feature Pack ID in the farm's property bag. The Subscription Settings service application must be present before executing scripts which work with Feature Packs. Adds the Feature Pack ID with a friendly name to the Farm's Property Bag for future use. In SharePoint Server 2013, a new licensing management capability has been added. Farm administrators can now assign licenses to users and enable runtime license checks. By using this new functionality, you can ensure that only users who have the appropriate license can use a specific feature. The functionality also simplifies the deployment model because you no longer have to build separate farms for standard and enterprise editions of SharePoint Server. User licenses are assigned by mapping claims to a known type of license. For example, a claim can be an Active Directory Domain Services (AD DS) Security group. By mapping the ContosoFinanceDept security group to an Enterprise license, you effectively assign an Enterprise license to all members of that group. Users who log on to SharePoint Server are assigned claims. SharePoint Server examines the claims of users to determine their license, if a user does not have a license to use a particular feature, SharePoint will block access to that feature at run time. This SharePoint Server 2013 license implementation is managed by using new Microsoft PowerShell cmdlets. By default, licensing is disabled in SharePoint Server. However administrators can opt to turn it on by using Microsoft PowerShell. For additional information about how to configure licensing in SharePoint Server 2013, see Configure licensing in SharePoint Server. Whilst this white paper outlines the key infrastructure considerations when designing a multi-tenant SharePoint 2013 solution and it provides baseline scripts for configuration the overall management of the lifecycle of operations is imperative. For example custom tenant administration, de-provisioning of subscriptions, archiving, user management, self-service password reset and quotas are all common areas which require some combination of additional Windows PowerShell and customization effort in order to deliver a complete service offering. Each service provider will have different requirements in this sphere and it is incredibly important to ensure that these requirements are part of the initial scoping and design work for the infrastructure platform. This section outlines the general steps for setting up and configuring a multi-tenant hosting SharePoint Server 2013 platform. This section provides details and contains PowerShell scripts that demonstrate the creation and configuration of various components. These scripts are generally provided to demonstrate the configuration requirements for multi-tenancy and therefore do not represent the optimal provisioning order, however they can serve as the basis for developing your own customized end-to-end scripting solution. The Microsoft PowerShell scripts contained in the following sub-sections are based (either whole or in part) on the work of Spencer Harbar (http://www.harbar.net) and are reproduced here with his gracious consent. Please refer to the following documents for his original work. The PowerShell scripts provided include variables, which should be modified to suit your environment. This section presents a deployment example which makes use of a single hosting web application using host named site collections and host header managed paths. It is deployed on a single server for the sake of simplicity, this is the intended design model for multi-tenancy with SharePoint 2013 and can be extended to a deployment where service instance roles are articulated across multiple computers. The deployment example uses HTTP for the web application. In a real deployment SSL should be used to protect sign-in, content and the authorization tokens used with SharePoint Apps and other OAuth2 related services such as Workflow Manager. Because host-named site collections will be used for a multi-tenant SharePoint environment, you must configure your DNS (that is, create appropriate DNS records, etc.) accordingly based on your plan. For additional guidance about how to plan host-named site collections for SharePoint Server 2013, see Host-named site collection architecture and deployment (SharePoint 2013). If you also plan to support apps for SharePoint, you must also configure DNS to support your environment. For additional information about how to configure an apps environment for SharePoint Server 2013, see Configure an environment for apps for SharePoint Server. The following Microsoft PowerShell script shows how to create a SharePoint farm. Initially a Managed Account is created for the application pool hosting the content web application. A new proxy group is created, followed by the web application. Finally, configuration of the Web Application to allow self-service site creation and the creation of shared managed paths is performed. It is extremely important to create a "root" site collection in the hosting web application even though this site collection will not be accessed by end users. This is required for supportability and correct operational behavior of SharePoint 2013. This example uses HTTP for the web application. $proxyGroupName = "Hosting Proxy Group"
Write-Host "Creating empty root Site Collection..."
Write-Host "Enabling Self Service Site Creation..."
Write-Host "Creating HNSC Managed Paths..."
Write-Host "Proxy Group and Web Application done!" At this stage the non-partitioned service applications can be created. These service applications are either required in the farm for normal operations (for example the State Service) or do not require to be partitioned in order to support multi-tenancy as they do not store any data. 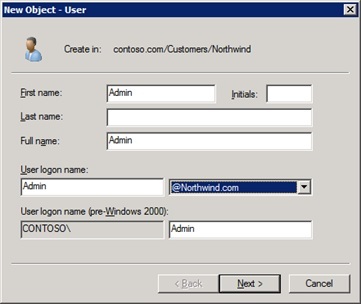 To do this another managed account is required, and then each service application is created in turn. The following Microsoft PowerShell script shows how to create the non-partitioned service applications. $subsName = "Subscription Settings Service"
$wmsName = "Work Management Service"
$pasName = "PowerPoint Automation Service"
Write-Host "Please supply the password for the $saAppPoolUserName Account..."
Write-Host "Creating $subsName Application and Proxy..."
Write-Host "Creating $appsName Application and Proxy..."
$proxy = New-SPAppManagementServiceApplicationProxy -ServiceApplication $apps -Name "$appsName Proxy"
Write-Host "Creating $wmsName Application and Proxy..."
$proxy = New-SPWorkManagementServiceApplicationProxy -ServiceApplication $wms -Name "$wmsName Proxy"
Write-Host "Creating $pasName Application and Proxy..."
$proxy = New-SPPowerPointConversionServiceApplicationProxy -ServiceApplication $pas -Name "$pasName Proxy"
Write-Host "Adding Workflow Service Proxy to Proxy Group..."
Write-Host "Non Partitioned Service Applications done!" The following sections describe the Microsoft PowerShell procedures necessary to create and configure each service application which supports partitioning. The same general pattern applies to each service application with the exception of Search and User Profiles. However there are small differences related to the service application proxies. The following Microsoft PowerShell script displays how to create the Business Data Connectivity service application in Partition Mode and add it to a custom Service Proxy group. $bcsName = "Business Data Connectivity Service"
Write-Host "Getting Service Application Pool and Proxy Group..."
Write-Host "Creating $bcsName Application and Proxy..."
The following Microsoft PowerShell script displays how to create the managed metadata service application in Partition Mode and add it to a custom Service Proxy group. Write-Host "Creating $mmsName Application and Proxy..."
The Machine Translation service supports multi-tenancy by creating its service application in Partition Mode. There is no tenant-specific configuration and the service is managed at the farm level. Its database is effectively acting as a queue and therefore has to be partition/tenant aware. The following Microsoft PowerShell script shows how to create the Machine Translation service application in Partition Mode. $mtsName = "Machine Translation Service"
Write-Host "Creating $mtsName Application &amp; proxy..."
The following Microsoft PowerShell script shows how to create the Secure Store Service application in Partition Mode and add it to a custom Service Proxy group. $sssName = "Secure Store Service"
Write-Host "Creating $sssName Application &amp; Proxy..."
The following Microsoft PowerShell script shows how to create the Search service application in Partition Mode. The script for this service application uses the Partitioned parameter rather than PartitionMode parameter. The Word Automation Services service application supports Partition Mode. There is no cmdlet for creating a proxy. The following Microsoft PowerShell script shows how to create the Word Automation Services service application in Partition Mode. $wasName = "Word Automation Service"
Write-Host "Creating $wasName Application &amp; Proxy..."
The creation of the User Profile Service by using PowerShell as required when provisioning in partitioned mode presents a challenge when not running the Windows PowerShell as the SharePoint Farm account. In order to work around this, and in order to successfully start the User Profile Synchronization service, we leverage the Start-Process cmdlet and simulate executing the script as the farm account. Two scripts are required, the first script creates the UPA and the second script calls the first script. This script should NOT be run directly otherwise it will be impossible to start the User Profile Synchronization service instance. This script should be saved locally and its location noted. Write-Host "Creating $upaName Application &amp; Proxy..."
The second script below performs the necessary work to call the UPA creation script and start the required service instances. The location of the UPA creation script should be updated in the $upaScriptFile variable. Additionally some required permissions are set on the UPA. Write-Host "Starting User Profile Service Instance..."
Write-Host "Please enter the Farm Account Password:"
Write-Host "Creating new process for UPA creation..."
Write-Host "Starting the UPS Service Instance..."
$upsInstanceName = "User Profile Synchronization Service"
Write-Host "Waiting on $upsInstanceName to provision..."
Write-Host "Baseline time is 130 seconds"
Write-Host "Still waiting... ($time seconds elapsed)"
Write-Host "$upsInstanceName provisioned, it took $time seconds." Write-Host "UPS Service Instance Started"
Write-Host "Configuring NETBios Domain Names and UPA Permissions..."
Information Rights Management support for multi-tenancy can be turned on by using the the SharePoint Central Administration website or the updated Microsoft PowerShell cmdlets. Verify that the user account that is performing this procedure is a member of the Farm Administrators SharePoint group and the Administrators group on the computer that is running Central Administration. From the Central Administration website, go to Security. On the Information Rights Management page, click Use this RMS Server. Make sure to place a check in the check box named Check this box in multi-tenant configurations to allow tenants to configure tenant level IRM settings. Set-SPSiteSubscriptionIRMConfig -identity $subscription -IrmEnabled -CertificateServerUrl "http://rms.contoso.com"
Generally such configuration is performed as part of tenant provisioning. This section describes the processes and approaches for provisioning tenants and customizing the multi-tenant environment. To create a tenant, follow the steps in the table. 1. Create a site subscription. 2. Assign a feature pack to the site subscription and configure custom OU by using People Picker. Set-SPSiteSubscriptionConfig -id $sub -FeaturePack $customerFeatures -UserAccountDirectoryPath "OU=$customerName,OU=Customers,DC=contoso,DC=com"
3. Create one or more site collections to be assigned to the site subscription. The following PowerShell script shows how to create a tenant admin site that uses the TENANTADMIN#0 template. If the tenant is configured to use an Enterprise Feature Pack, the Microsoft PowerShell script performs additional operations, that is, it creates the My Sites collection. $upaProxyName = "Tenant User Profile Service Proxy"
$mmsProxyName = "Tenant Managed Metadata Service"
# this script assumes that the Content Web App and necessary Managed Paths exist. Write-Host "Assigning Feature Pack and configuring People Picker..."
Write-Host "Creating Tenant Admin site..."
Write-Host "Tenant has SharePoint Server features"
Write-Host "Creating My Site Host..."
Write-Host "Configuring Tenant Profile Config..."
Write-Host "Creating Content Type Gallery..."
Write-Host "Configuring Tenant Content Type Gallery..."
Write-Host "Activating Content Type Hub..."
Enable-SPFeature -Identity ContentTypeHub -url "http://$customerName.contoso.com/cthub"
Write-Host "Tenant Provisioning Script Completed!" This approach can be further customized to contain other tenant configuration such as for Workflow, Apps and IRM. Generally such script is encapsulated into a function or custom cmdlets which enables it to be run repeatedly for future tenants. SharePoint Server 2013 brings a major advancement to workflow, including enterprise features such as fully declarative authoring, REST and Service Bus messaging, elastic scalability, and managed service reliability. SharePoint 2013 can use a new workflow service built on the Windows Workflow Foundation components of the .NET Framework 4.5. The new service is called Workflow Manager and it is designed to play a central role in the enterprise. The SharePoint 2013 Workflow platform becomes available to you, and your tools, only after you download and install the new Workflow Manager Service and configure it to communicate with the SharePoint Server 2013 farm. For additional information about how to install and configure the Workflow Manager Service for SharePoint 2013, see Install and configure workflow for SharePoint Server. To configure the Workflow Service, use the Register-SPWorkflowService cmdlet to register the farm with the Workflow Service Manager in Partition Mode. In doing this, use the SPSite parameter to pass the URL of any existing tenant site collection from your Farm and use the ScopeName parameter to define a named workflow scope for your farm. The following Windows PowerShell script shows how to register the SharePoint farm with the Workflow Service Manager in Partition Mode. Register-SPWorkflowService -SPSite "http://tenant.contoso.com" -WorkflowHostUri "http://WFSvr01:12291" -PartitionMode -AllowOAuthHttp -Force -ScopeName "HostingFarm"
Write-Host "Farm Workflow Registration Script Completed!" To enable a specific tenant for SharePoint Workflow, you must configure the workflow service proxy. In doing this, obtain a reference to the root site collection of the tenant and register it with the workflow service proxy. The following PowerShell script shows how to enable a tenant for SharePoint Workflow. Write-Host "Tenant Workflow Registration Script Completed!" After the tenant is configured to use Workflow Service Manager, you are then able to use SharePoint Designer to create workflows using the SharePoint 2013 Workflow option as shown in the following diagram. Use the Custom Action Definition Schema to add and remove links on the main page of the Tenant Administration site. The following feature definition shows how to add a new group, several links, and remove the link to the Manage Site Collections page. For additional information about custom actions, such as the default IDs for built-in links, see Custom Action Definition Schema. When customizing the Server ribbon, you can add, replace, and remove controls, groups, and tabs. Customizations to the ribbon are defined by using Server ribbon XML in a feature and can be deployed in a solution package (.wsp file). Ribbon customizations can be scoped to a particular list type by using the RegistrationId and RegistrationType attributes. Customizations can also be scoped to a site or to a particular web application by using the Scope attribute in the Feature.xml file. The following XML shows how to replace the functionality of the Disk Quota button on the Manage Site Collections page. For additional information about how to customize the Server ribbon, see Customizing the Server Ribbon. You can use custom properties to extend tenant management functionality, such as tenant quota management. The following PowerShell script shows how to access custom properties.